This morning, St.Amant was officially announced as one of Manitoba’s top 30 employers in a special supplement in the Winnipeg Free Press. St.Amant’s expanded clinical team works with the Jordan’s Principle: Child First Initiative in remote northern Manitoba communities. 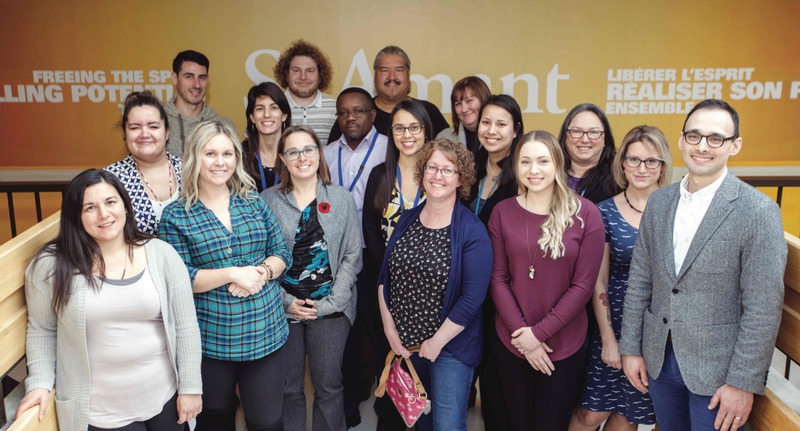 St.Amant has over 1,800 staff across the province and together they support Manitobans who have a developmental disability, acquired brain injury or autism to reach their full potential. As a leader in Manitoba for 60 years, St.Amant offers innovative services that promote meaningful relationships, valued social roles, independence, human rights and quality of life. St.Amant’s person-centred, broad service approach supports the person while also supporting and honouring families and natural support systems. The organization unveiled their five-year strategic plan at a town hall earlier this fall. To ensure the plan is relevant and that St.Amant is indeed meeting the needs of its community and heading in the right direction, their strategic planning process involved wide stakeholder consultation with families, funders, partners and their staff. “We have a strong history of serving the most vulnerable, of offering services where no one else would. That mission, tenacity and compassion of the Grey Nuns will continue as we move through the next five years of our strategic plan. Our community, who embraced the development of this plan and gave of themselves in its creation, will continue to be involved as we move along our journey. We rely on these groups to help us stay the course and to ensure we are aware and addressing the most pressing needs. Together we will make our community better, stronger and inclusive,” said John Leggat, President and CEO. Knowing that employees really are their biggest asset, St.Amant works hard to offer excellent support to its staff. Staff have access to excellent training and development opportunities. Some are formal and required for their role and many are self-directed. Since introducing their English at Work for newcomers program in 2014, more than 125 staff and volunteers have directly benefitted from more than 10,000 student hours of English language training and support, which includes 1:1 tutoring at their head office or in a community home in addition to classroom time. This group organizes events that promotes various cultures while also enhancing the profile and benefit of a diverse workplace. The organization hosts an on-site Toastmasters group, offers many health and wellness benefits, such as a low cost gym, mediation and mindfulness activities and encourages staff to work together to come up with new and innovative ideas. Employment opportunities abound at this ever-growing organization in all kinds of roles. From clinical staff in the areas of psychology and social work, to nurses and administrative positions, there are always opportunities to join the team. The most common opportunities are in direct support, a role where you work hands-on with people with disabilities to ensure that they are participating in life in a meaningful way. This work encourages staff to build relationships in the community, with family members and most important, with the people they are supporting. This is a great job for people who are motivated by supporting and encouraging choice and independence and are rewarded by seeing people achieve their goals. St.Amant employees are generous and definitely care about the people they support. In fact, St.Amant has one of the highest staff engagement rates in fundraising to support the St.Amant Foundation. Every year, staff volunteer at the St.Amant Foundation’s signature fundraising event, the Free the Spirit Festival. “Staff see the benefits of their donations and volunteer efforts. We’ve seen so many exciting outcomes thanks to those who donate, such as two men taking a trip of a lifetime to the Rockies, a new wheelchair-accessible van for one of St.Amant’s community homes and major renovations to living areas at our complex care facility,” said Juliette Mucha, Director, St.Amant Foundation. Staff are truly part of the community and also support other local charities such as the Christmas Cheer Board, Winnipeg Harvest, Manitoba Marathon, Dragon Boat Festival and the Movement Centre Bike Race. For the past two years, St.Amant was represented as an employer in the Winnipeg Pride Parade. St.Amant is proud of their work environment and organizational culture making them one of Manitoba’s Top Employers for the eighth year.